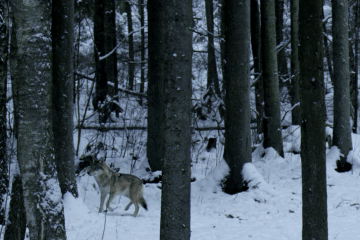 Filmed in one of the last remaining patches of old growth forest in Lithuania, "The Ancient Woods" is a place where the boundaries of time melt and everything that exists does not wither or age but “grows into” eternity. A poetic and atypical nature film takes its viewers on the endless journey – from the forest thickets to the wolves’ caves and up to black stork’s nest, and then deep into the water to the underwater forest, returning after to the human beings inhabiting the edge of the woodland. There is no commentary, only rich, almost palpable sounds of the forest and the magical situations captured by the camera. The film gently erases the line separating the human and natural lives, interweaving them into a single poetic story. Its style and narrative brings it close to a fantasy tale. The “Ancient Woods” was shot using original climbing and diving equipment, which enriched the cinematic language with a variety of camera angles and shots.